Haha Some of these desktops are amazing, I feel like im kind of under achieving, i have clicked a few links and I am currently editing mine !! Fingers crossed it will look half as good as some of these!! I am JEALOUS!! It amuses me that people with Tiger are trying to get the "glass" dock, whilst me with Leopard spent ages trying to get rid of the damn thing. This friday? You should go next friday when I'll be there for the iPhone launch! Oh well! Have fun. It's an amazing store. It's still a treat for me to go even though we have two here in Manchester. EDIT: In the mac store, PS of leopard on a 24" iMac!! W000T! Will have leopard installed by tonight. YEY!! Aurora Borealis (Northern Lights) from the International Space Station. Cause she is smokin' hot! She is a big Mac user also!! Ok so that was a lie but man she is hot!! Haha! Yea she is phiiit!! 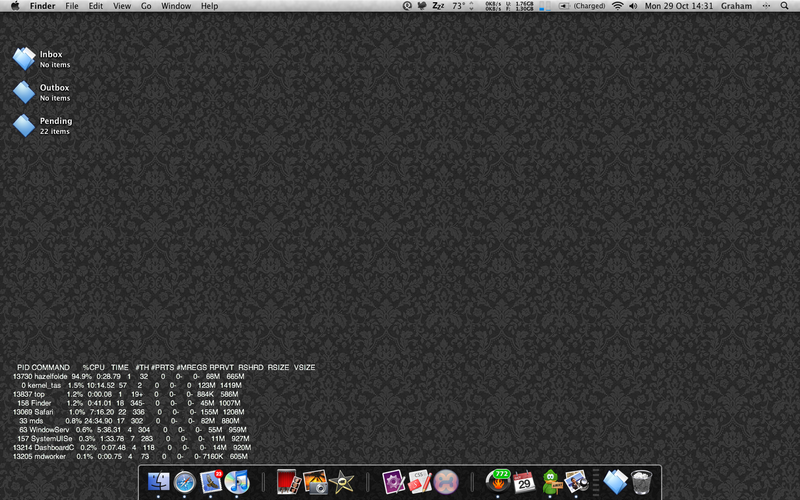 Update on my desktop, since the last one, I have leopard and diff wallpaper and icons! thats hottness whatts with the fuzzy animals? haha I love the Art toys icons and the Creatures. I have like 500 icons, so I have already started on changing all my programs icons. The ones that are shown are.. I added another one now, but you will have to wait till next time to see it! Interests:Apple, the mac, ipods, computers in genreal. Finally got around to posting mine.